'Tis the season to be jolly, being December, so time to return to the Holiday theme with this 1981 classic from The Waitresses. 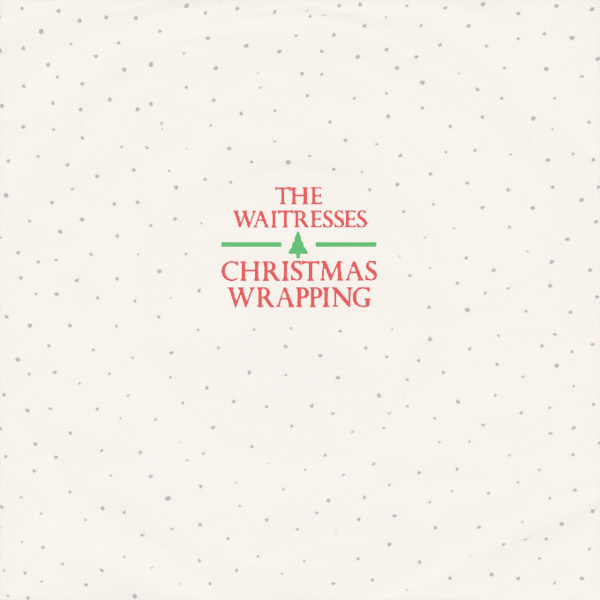 In the song, Christmas Wrapping, the waitresses appear to have forgotten something and call around at the shop to get it (cranberry sauce or some such necessity). Whilst at the shop, having decided that they won't be doo-ing Christmas, they bump into a guy who seems equally pissed at (or on) seasonal cheer and what do you know, they get it together and enjoy the day after all. Happily ever after, or at least until Boxing Day when they guy concerned wakes up and realizes that the cover of their single is one of the most boring Christmas pieces of album art that exists. In the new cover, we now see two young ladies who could very much be waitresses dressed in festive outfits ready to wait upon those in need of seasonal sustenance. They seem in a very cheerful mood and are giving each other a hug. No doubt it's a bit cold in December wearing just a red bikini and a Santa hat. Note that the bikinis do not have any white fur trimming, and therefore the ladies are clearly not Canadian. If these are indeed the Waitresses, then perhaps the guy they meet at the store wakes up happier than he has previously been given credit for. If only this had been the original cover for the single, they might have got an offer from the guy (or many others) without the need to have driven down to the shops.